The Longines Heritage range of watches embodies the rich 180-year culture of Longines. Style, tradition and precision are combined beautifully in the Longine Heritage collection to pay testament to Longines' rich history in producing luxury Swiss watches. 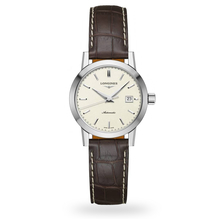 A Longines heritage timepiece is certainly a timeless watch to own. This Longines 1832 Ladies Watch comes equipped with a 30mm case, which houses the beige dial and hand-made automatic movement that provides the power. Attached to the case is a alligator skin leather strap for increased comfort on the wrist. The timepiece is water resistant up to 30 metres.